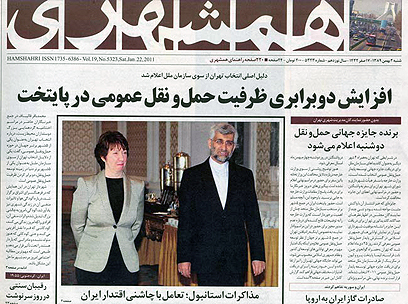 The outfit worn by European Union foreign policy chief Catherine Ashton to the nuclear talks in Istanbul this weekend appeared too revealing for the sensibilities of Iranian media - who sought to correct the faux pas by censoring her neckline in front page photographs, British newspaper The Telegraph reported Tuesday. 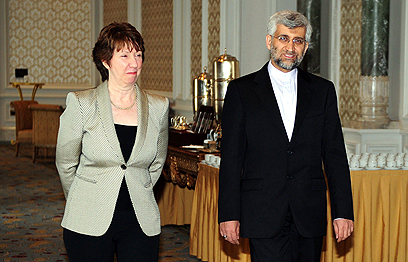 According to the Telegraph, Ashton made an effort to steer clear of any physical contact with Iranian chief negotiator Saeed Jalili during the talks in order to avoid offending the Muslim world. What she did not know was that her seemingly conservative top was enough to appear immodest, prompting the Iranian censors to give her a higher neckline. "She was properly dressed," A spokesperson for Ashton told the Telegraph in response. "It was not low-cut. Many women in Iran are in a complete veil. These were international negotiations in a third country." Such tweaking is not out of the ordinary in Iran; actresses who are photographed in foreign countries in revealing clothing often get digitally covered up, while in 2008 photos of a rocket-launching operation of the Iranian army was proven to be edited – an extra rocket was added to the three that were actually launched. The pictures of Ashton were taken during the meeting that took place between the UN Security Council and Iranian negotiators in Turkey to discuss the Islamic Republic's nuclear technology. The talks were generally regarded as a failure, as the world powers found Iran's demands unacceptable. See all talkbacks "Iran censors Ashton's 'plunging neckline'"